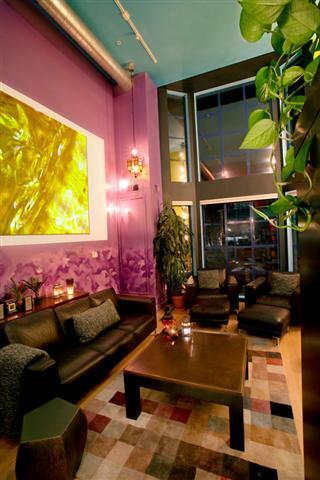 This color filled, light and happy loft was designed by Susan Diana Harris whom I know from Twitter. The Mission Loft is featured on her website, and when I saw it I immediately asked for copies of the photos for a home tour. 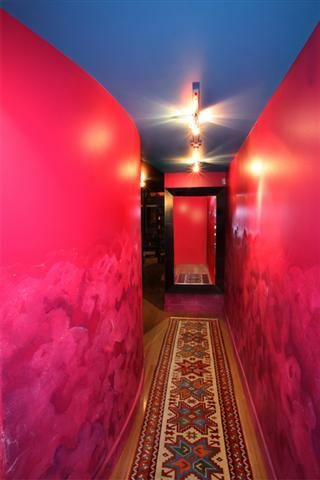 Below is the entryway – if you think that’s colorful, just wait till you see the rest of the place. 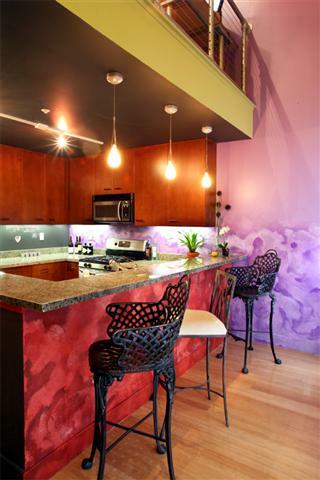 Bright fuschia walls with a cobalt blue ceiling – but it isn’t Morocco – it’s San Francisco. 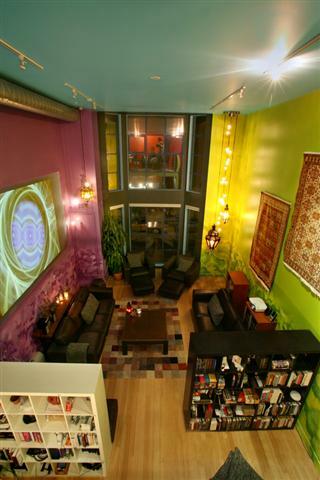 The owner of this Mission loft is an avid fan of Scott Draves’ Electric Sheep – an open source screen saver that displays a kaleidoscope of light, thanks to thousands of people and their machines all over the world. 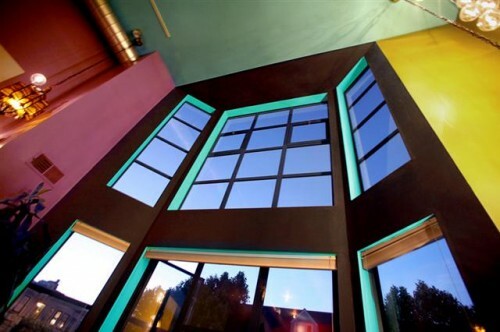 Not surprisingly, this owner also loves color. I enjoy blending traditional pieces in modern settings in non-traditional ways. The owner’s kilim collection serves as a traditional foundation allowing us to play with modern architecture, brightly colored walls, and ever-changing artwork projected across a 14′ screen! While far away from the sofa, the distant 17’0″ ceiling needn’t feel cold or uninviting. The owner wanted a campfire feel, so I brought him the stars! Nineteen clear glass orbs fall effortlessly around the pendants of this necklace-like composition. 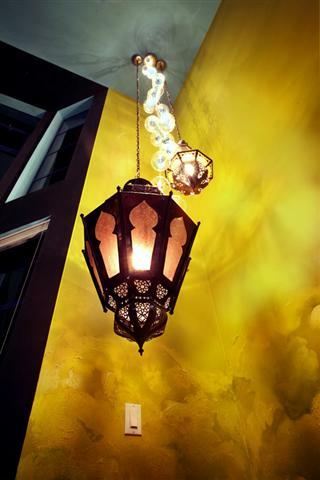 The centerpiece are two brass Moroccan lamps with colored lenses from Tazi Designs. The beads are ET2′s Starburst orbs, encasing individually lit stars of amber, green or violet glass. The 41″ tall Moroccan lamp hangs just above the sofa – anything smaller would have been dwarfed in such an expansive space. I fell in love with the shocking use of color, which was done very successfully in my opinion. Had Susan not made the walls and ceiling so bright, the brown furniture with gray accessories would have looked dull and predictable. Instead, the bright walls bring character to the space and the dark furniture anchors it. Somehow it all flows. The textured wall effect mirrors the movement in the Electric Sheep. The effect only goes partially up the wall as to not overwhelm the space with movement. I can’t even imagine what a nightmare it was to paint that ceiling such an intense color. That’s definitely a more than one coat job. That carpet is stunning. And that is a red wall done well. Not an easy thing to do. 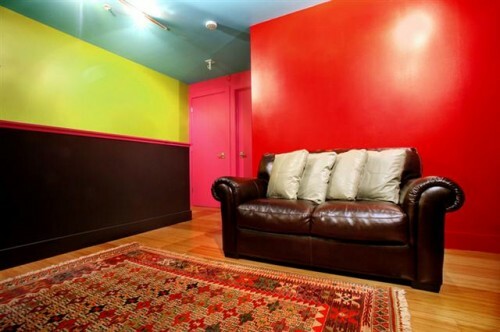 This room is in the office – red and yellow are active colors. They promote activity – so this is great for a workspace. The kitchen is tame compared to the rest of the apartment, which might be a good thing. Having such active colors in a kitchen is great if you love to cook, but it reflects on your wasteline. Need to gain weight? Have a red kitchen. Need to lose weight? Have a blue one. 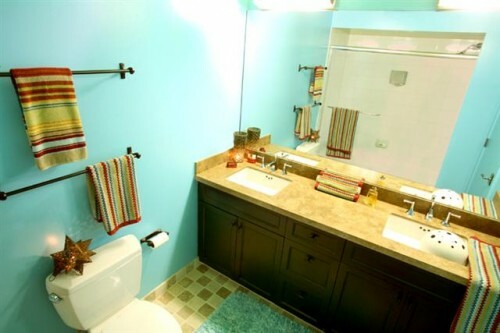 Even the bathroom gets the color treatment with sea blue walls. 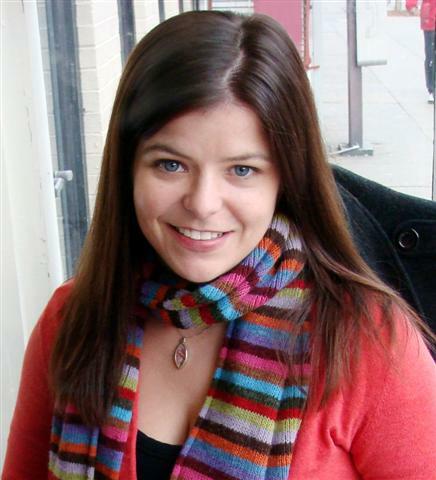 Susan Harris – an interior designer who is not afraid of color! This entry was posted in Color, Home Tours by Shira Abel Shvo. Bookmark the permalink. I LOVE it!!!! The use of color here is masterful, Kudos to Susan Harris!! Thanks Shira, you brightly inspired my day. I’m on the fence on this one – I just can’t decide. Living there would give me a headache, that’s for sure, but it’s fun to look at. I’m so happy to see the Electric Sheep given such a honored place in this home! Thanks to the owner and the designer. Higher quality is available in limited edition directly from the artist as an infinite installation and Blu Ray.